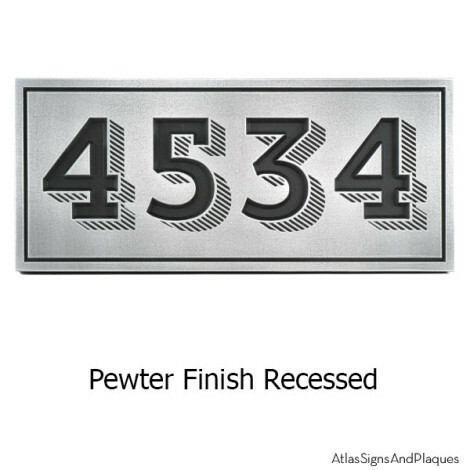 Trend Slab Address Plaque is one of the most Trendy contemporary Address Plaques ever. Named after the new Trend Slab Font from Latinotype, it works wonderfully as an easy-to-read business or house sign. Although this address plaque is designed as 2 Dimensional, the drop shadowing effect of the Trend Font gives it a real magnified 3D appearance that is bold, legible, and interesting to the viewers eye. This entry was posted in NEW - Be in the KNOW and tagged 2D looks 3D, Address Plaque, contemporary, drop shadow, finished, metal coated, trend slab on September 15, 2014 by AtlasSigns.